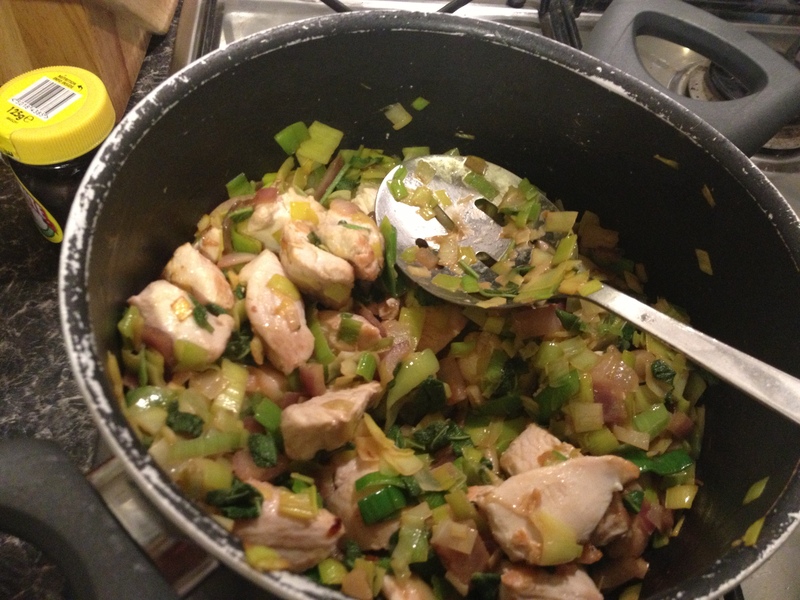 Turkey in Creamy Sage and Leek sauce. I like to eat simple, tasty food. If it reheats well, all the better, as batch cooking is the way to go. I also like eating Turkey a lot, if you hadn’t noticed. This recipe is something I make all the time with little fuss. It’s simple enough for a midweek meal, ‘dressy’ enough to serve to your in laws or guests, and so darn delicious my mother requested it for her Birthday dinner. 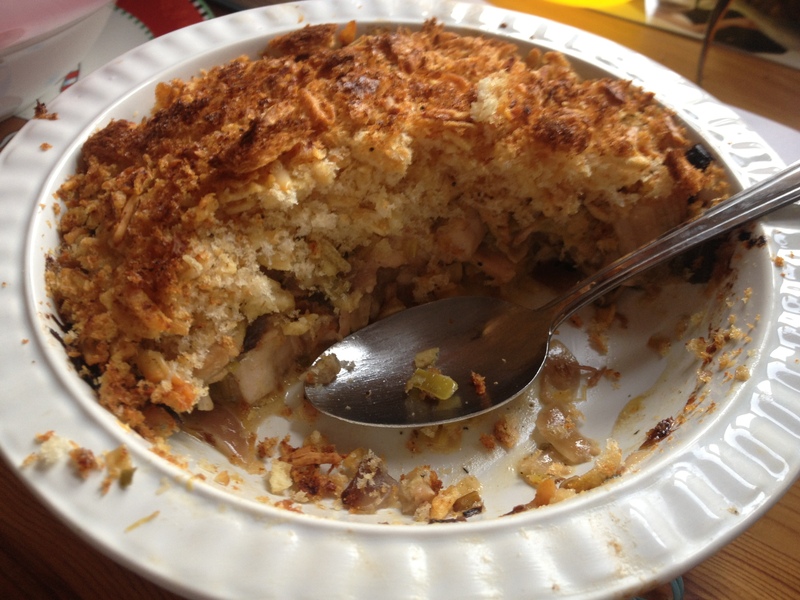 If you were here in December and liked the Boxing Day Pie recipe, you’ll like this dish. If the pie was the short martini, then this recipe is the long highball. They’re very similar in their make up, which is no accident. I wanted to enjoy the same delicious flavours from the pie, but in a quicker, easier way. I also don’t keep crisps in the house as the matter of course, so a recipe I could pull together from things I *do* keep in the house on a regular basis was a plus. If your turkey isn’t already cooked (and this is a great recipe to use up cooked meat), brown the pieces in your pan to seal them for a few minutes then set aside. Finely chop your leeks (all of the white part, and as much of the green top as you like) and onion and sweat them off in the butter over a medium heat. Roughly chop your sage, stalks too if you like, and add to the pot. Stir them through the other vegetables quickly. Now add everything else (wine, creme fraiche, turkey, crumbled stock cubes and a pinch of salt and generous twists of pepper) and stir to combine over the heat. Let the delicious mixture cook for 15-20 minutes, or until the mixture is a little reduced and yellowed, and the turkey is cooked through. Taste, and adjust the seasoning if needed. This recipe is child’s play, and from prep to finish, including the accompaniments, shouldn’t take more than 50 minutes. This much meat makes four generous portions of mixture, and it reheats well. You may need to add a drop of water when reheating it to loosen off the sauce again. It’s so flavoursome and delicious, the sauce will complement any vegetable, so it’s great for getting fussy eaters (*cough* me *cough) to eat their greens. Of course, this recipe would work with any white meat, and a clove or to of garlic sweated with the onions wouldn’t hurt, if you are that way inclined. You can also substitute the wine for mead or cider if you are short of adult grape juice. However you eat it, enjoy it! It doesn’t matter how much of a bah humbugging, grinchy, festiveness resistor you are, you can’t deny it any longer. 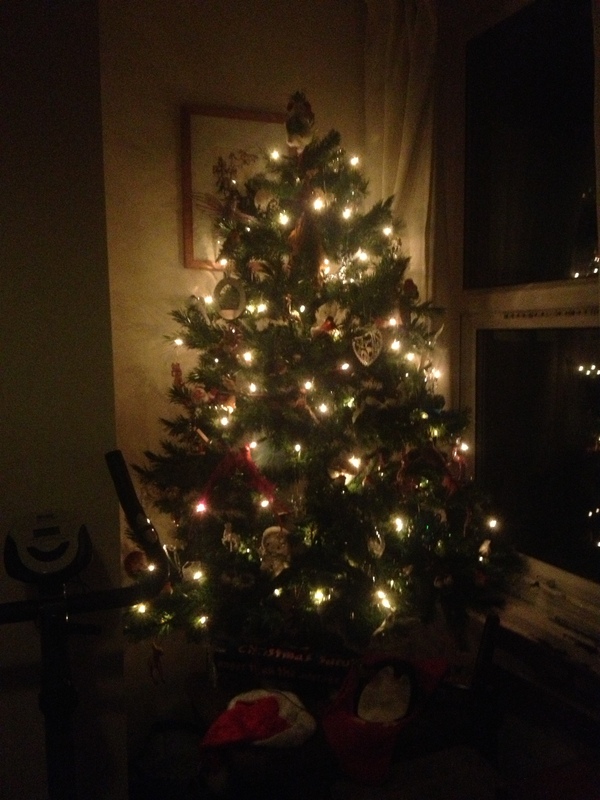 Christmas is coming, and Christmastime is here. As I sit here, tree up and decorated, Christmas cookbooks littering my countertops and a glass of Bucks Fizz in hand, I know I’m a Christmas lover. I often joke with friends that I’m a quarter German, a quarter Polish and a quarter Christmas Elf. I think a lot of my life’s problems would be solved by baking cookies in a magic tree for a living. In my spare time I’m an artist among other things, and in the past I have created artwork Advent Calendars to celebrate my love of the season, and challenge myself. Since this year I’m enjoying food writing so much, and I haven’t got an easy and convenient way to put my artwork on the internet (my scanner died), I thought to myself; why not do a recipe Advent Calendar here on she-who-bakes.com? Ok, so it’s the third, so I’m already behind, but worry not, I shall catch up swiftly I’m sure. My recipe book is heaving with festive goodies, plus I have dozens of treats I want to try. To start off with, I want to share a recipe that might actually be most useful from Boxing Day onwards: Christmas Dinner Soup. This recipe is useful year round for using up roast dinner leftovers and stretching a meal further. It might not be the healthiest soup out there, but it’s delicious, adaptable and kind to your pocket. And if you are anything like me when it comes to spending around Christmas, any way to save a few pennies is a godsend. This recipe is more a method, and as mentioned above it is adaptable to whichever meat you’ve roasted, and whatever you’ve got left over. I will of course be writing out a recipe based on Christmas Dinner, or turkey roast leftovers. Serves 3-4, depending on how much of a glutton you are. If you want a chunky soup, make sure to chop everything before hand in to bite size pieces, and finely chop up your stuffing. If you want a smoother soup, you needn’t chop, but you’ll need an immersion or jug blender. In a large sauce pan, cook off the onion. Next, add your vegetables and potatoes to warm through and begin to break down as required. Unless you have your own homemade stock, make up one cube of stock with a generous litre of water and add the gravy granules. If you have leftover gravy, just add this to the pot instead and omit the granules. 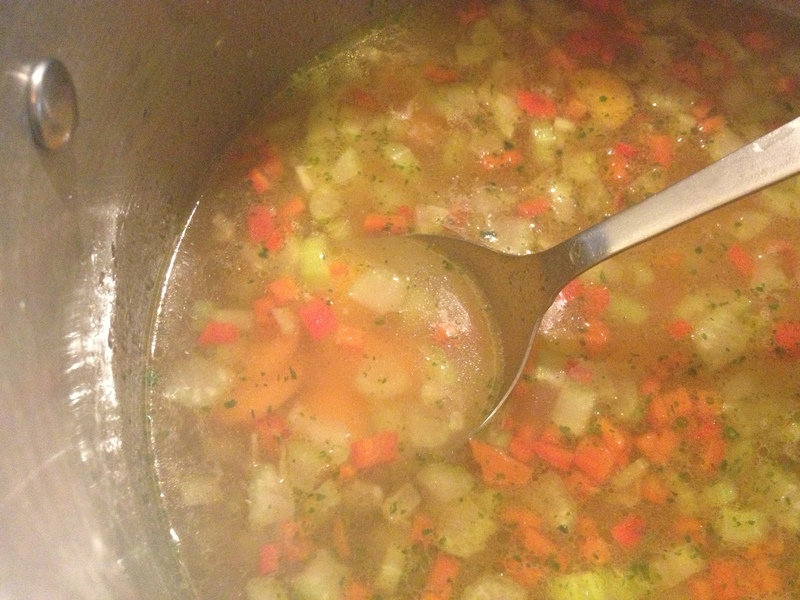 Add the stock mix to the pot and stir through. Chop up your stuffing and add to the soup. Break it down as the all the ingredients reheat. Season to taste. If you want a smooth, thick soup, then blend to your desired consistency. If you are using a jug style blender, leave the lid off and cover with a tea towel, as the mixture is hot and it is dangerous to blend a hot mix with the lid on. Add back to the pan and loosen with hot water if required. Add chopped turkey and heat through for at least five minutes. If you like a chunky soup, then when you are happy with the thickness and texture, chop up and add your turkey and heat through in the soup for at least 5 minutes. Just before serving, add your cranberry sauce and stir vigorously to combine. Serve with fresh bread. 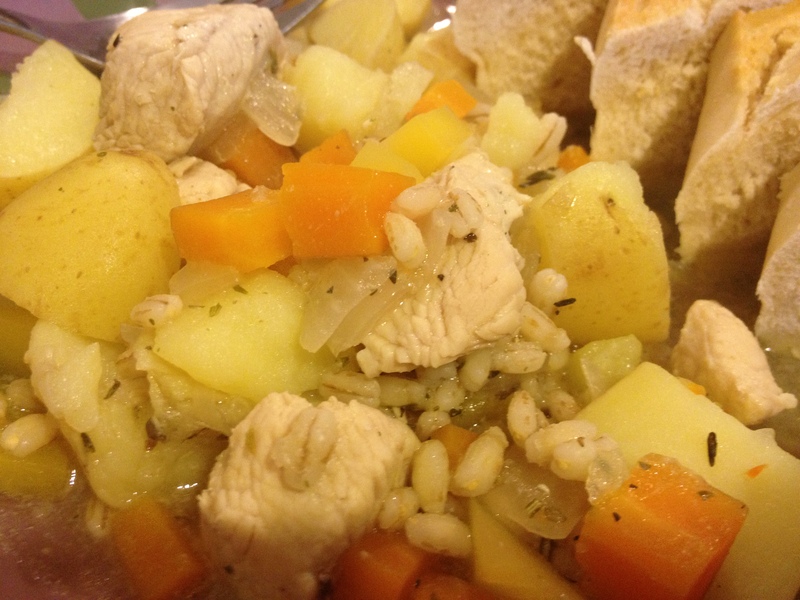 This is a great ‘monday night meal’ after a sunday roast to use up your leftovers. You can tweak the measurements to how much stuff you have left, and you can bulk out the soup with fresh veg if required. I think the real crucial ingredient is the stuffing, as this thickens the soup and adds so much good flavour. If you are light on stuffing leftovers, however, you can use extra potatoes instead. In terms of adaptability, you just use up whatever vegetables you had to accompany the meat. If you’ve had beef, why not use mustard or horseradish in the place of cranberry sauce. For lamb, why not mint or redcurrant? And of course, pork’s best friend is apple. This mix also freezes, so if like me you live alone, but cook too much, you can store the odd portion to crack out when you can’t face the stove. The soup is super tasty and filling, and essentially free as you’re just using up the leftovers from another meal. This recipe is super for boxing day or the 27th, when you really want some fridge space back and can’t stomach another turkey sandwich. I hope you’ll try it, and more importantly enjoy it! Speaking as someone who has had two colds in less than two months, and has been ill between both of them with a persistent sore throat and tonsils that are big enough to enter the World’s Strongest Man contest (I call them Gaston and Hulk), I believe the titular sentiment to be completely true. You can’t even cool down properly when your fever goes up, short of sitting in the shower, and just when the weather finally gets good enough for a couple of hours to go outside and enjoy it, you’re penned up inside, clinging onto the kitchen counter for balance as your head swims in snot, hacking up your internal organs and wondering if you can make Lemsip any less heinous by turning it into an iced tea blend. I’m trying to eat better (illness + lethargy + lack of time= junk), and right now trying to eat myself well. 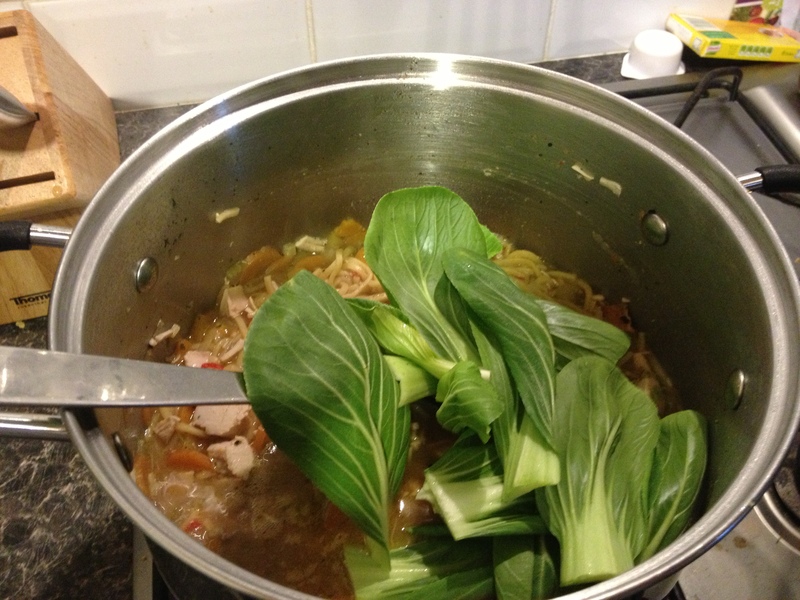 So I made a broth: simple to make, simple to eat, tasty and nutritious. The following uses Turkey, as I don’t eat Chicken, but the recipe would work just as well with Chicken, or with extra veg or a meat substitute to make a hearty soup. In a large saucepan, gently fry off the onions (roughly chopped- you’re ill, remember) in a smidge of light olive oil. Cube your potatoes 1-2cm cubes and dice your carrots and swede into 0.5cm cubes. You want them to cook within 20 minutes at a simmer. Once the onions are fried, add the remaining vegetables and turkey to the pan. Stir to thoroughly mix. Boil the water and dissolve your stock cubes in it. Pour into the pan. Thoroughly rinse the barley in a sieve, and then add to the pan. Season with salt, pepper and a pinch or two of herb de provence, thyme or your preferred green herbs. Give the pot a good stir, raise it to a vivacious simmer and go and collapse for 15-20 minutes while it cooks. Serve with bread. Best eaten under a blanket to chase the sick away. Breast meat can become a little dry in this recipe, but it still tastes good. You can always brown it in the pan with the onions, then remove before adding all the vegetables, and return to the pan for the last 5 minutes. In this case, make sure it is cooked through before serving. If in doubt, use leg meat, which is often cheaper than breast anyway. This recipe is suitable for people with wheat intolerance (without the bread of course, or with a gluten free substitute) if you chose a gluten free vegetable stock cube (such as Knorr). It’s also dairy free, and if made with just vegetables or a meat substitute, is suitable for vegetarians and vegans. 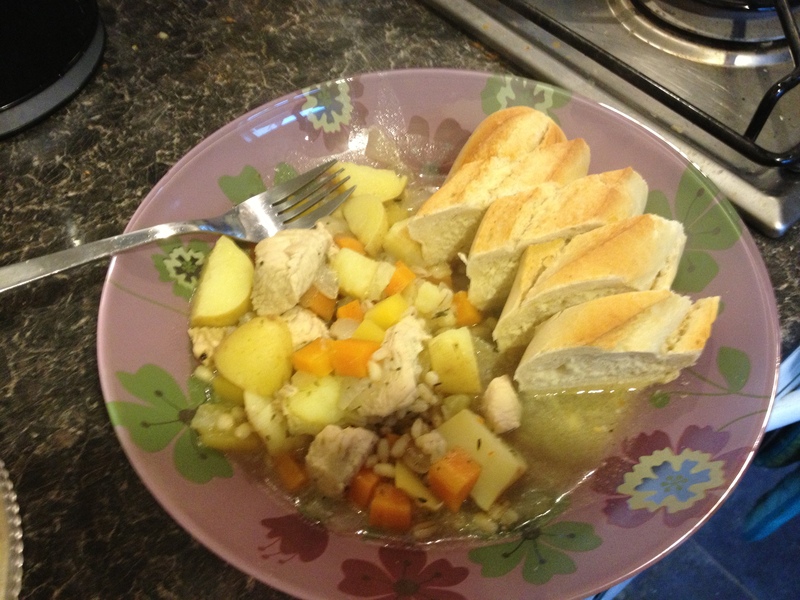 It tastes amazing; warm, savoury, hearty but not heavy- like a hug in a bowl. Whilst I’ve made this in summer (and it isn’t *too* heavy to eat in the warm weather we’re finally having in England), this simple dish is suitable for a winter warmer, and is definitely a mid-week meal: it takes less that 40 minutes to prepare from scratch, including chopping veg. If you’re interested, I took lots of pictures of prep etc, so I’ll pop them on Tumblr. I’m going to go back to nursing my chest infection. Blech. If you’re poorly too, fell better!